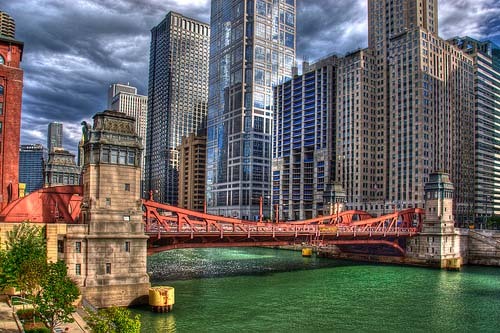 The La Salle Street Bridge (or Marshall Suloway Bridge) is a single-deck double-leaf trunnion bascule bridge spanning the main stem of the Chicago River in Chicago, Illinois, that connects the Near North Side with the Loop area. It was constructed in 1928 at a cost of $2,500,000 by the Strobel Steel Constructing Company. The bridge was part of a scheme to widen LaSalle Street and improve access from the Loop to the north side of the river that had been proposed as early as 1902. The design of the bridge, along with those for new bridges at Madison, Franklin, and Clark streets, was approved in 1916. LaSalle Street is a major north-south street in Chicago named for Sieur de La Salle, an early explorer of Illinois. 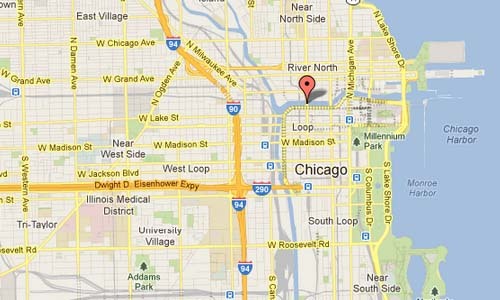 The portion that runs through the Chicago Loop is considered to be Chicago’s financial district. The street, Chicago Board of Trade Building, and 200 North LaSalle were used in the 2005 film Batman Begins and its sequel The Dark Knight. The view facing south down the canyon has been used in the movies The Untouchables, Public Enemies, Transformers: Dark of the Moon and Road to Perdition. The canyon was in the movie Ferris Bueller’s Day Off. The photo with the Volvo C30 driving on the La Salla Street Bridge was modified on the computer. 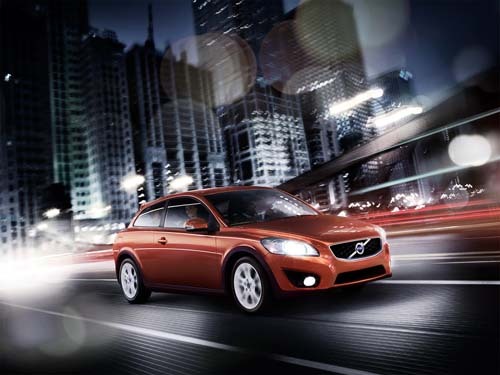 The crew shoot a backplate in Chicago and the Volvo C30 was later added later in the studio in England. 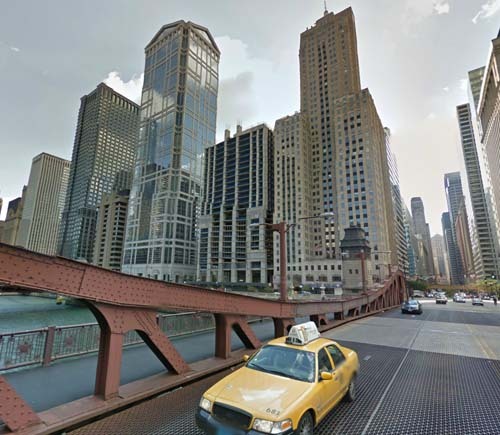 The used backplate from Chicago was turned 180 degrees (as you can see in the original streetview photo). More information at en.wikipedia.org and www.harniman.com.